Gambling is taking over late night TV and the high street here in the UK. The amount of money being ploughed into the betting shops and TV advertising indicates very clearly that more and more money is being taken from the punters, and of course a large number of them tend be people who are not well off and even in financial difficulties. What’s more disgusting is that the UK’s National Lottery has jumped on the band wagon, doubling the ticket price and hanging out more and bigger prizes to entice the suckers. I have had a line on the National Lottery on each of the two gambles a week for several years now. The odds are greatly against winning much of course, but at £1 a time it seemed worth a go. Now it’s been put up to £2; I’ve reduced my submission to once a week. Addiction to gambling is something I’ve never been able to understand, but if anyone had an experience likely to get them hooked it was me. It’s a good story so I thought I’d set it down. In March 1963 I had just begun to work, in a lowly position, as a journalist. Money was extremely tight but there was a very beautiful young lady who had agreed to go out for dinner with me. We went to a central London restaurant – somewhere near Leicester Square. I can’t remember what we ate, but I shall never forget what we drank: Ayala champagne. 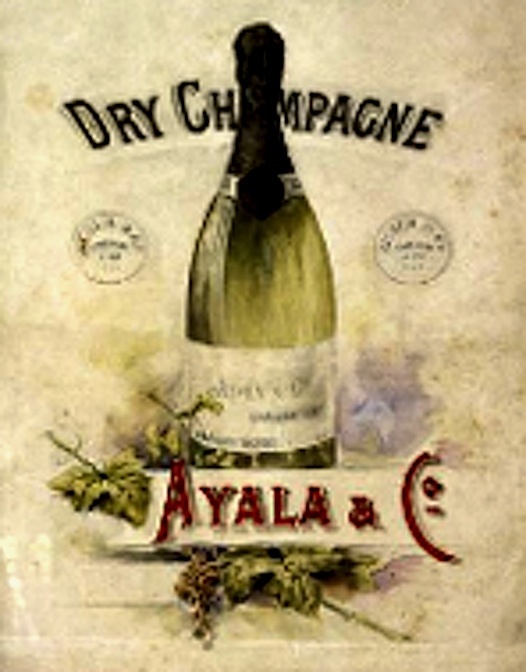 In those days Ayala was a small, independent champagne house growing its own grapes on 40 hectares near the towns of Aÿ and Mareuil-sur-Aÿ. Although not considered one of the greatest houses, it had a reputation for a particularly dry champagne (‘goüt anglais’), my taste, and had been favoured by Kings Edward VII and George VI. In 2005 the ‘chateau’ was bought by the Bollinger champagne house, without the vinyards, and is now made from grapes acquired through the massive grape purchasing power of Bollinger. According to Tim Hall in his blog Scalawine, to which I am grateful for the historical information, it is a “Champagne Phoenix indeed” and his tasting notes for the bruts assure me that I’ll like it a lot if I take a bottle now (maybe for Christmas – maybe I’ll win the Lottery 🙂 !). What has all this got to do with gambling? Having taken the young lady home, and subsequently arrived home myself, I woke the next morning, 31 March, to find I had just one £5 note (no credit cards then) to last until the end of April (having gone on the spree with my March salary). Now, horse racing has never interested me, but the name ‘Ayala‘ jumped off the newspaper page on the day of the Grand National. 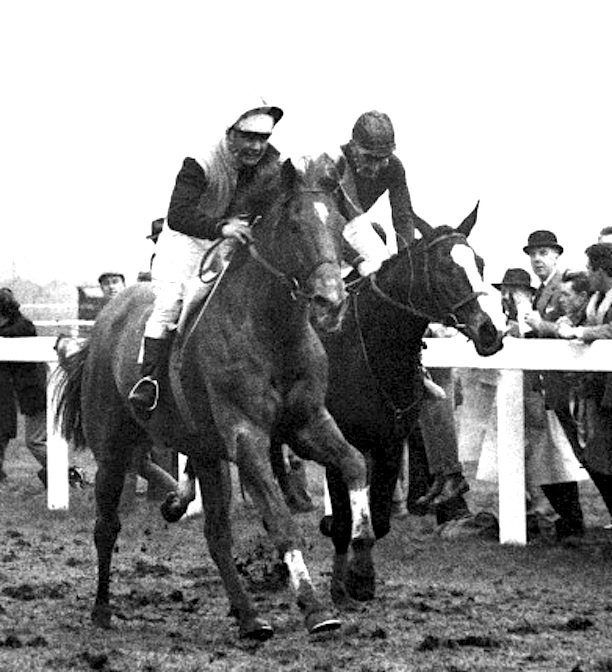 I read that this horse was an outsider, with odds of 66:1. I also read that it was owned (or rather part-owned) by the celebrity hairdresser of the time (the first real ‘celebrity hairdresser’ who subsequently trained Vidal Sassoon), Teasy-Weasy, real name Peter Carlo Bessone Raymond. I went into a betting shop for the first time in my life. I put my £5 note on the counter and, no messing, “Put it all on Ayala to win”, I said. Ayala powered through in the last few moments to just be first to the winning post (left horse in the picture above) and I collected £330 – that’s about £5,500 in today’s money by the most conservative estimate. But it didn’t change my view of gambling; I’ve never been in a betting shop since and, apart from my minimal weekly Lottery flutter, have never gambled in any other way since either.